I love listening in to conversations. I was in Paris, in the Marias, my favourite place in Paris. Just sitting, drinking a coffee, listening in to the man in front of me conversation. What caught my eye was the man saying something to the man coming towards him. What? That’s what was frustrating. Too much street noise to hear properly! This week’s black and white photograph. Conversations in Paris. Gallery | This entry was posted in Black and White Photography Challenge, photography and tagged Black and White photography, Black and white street photography, France, France travel, Le Marais, Monochrome photography, Paris, Paris France, Street Photography. Bookmark the permalink. 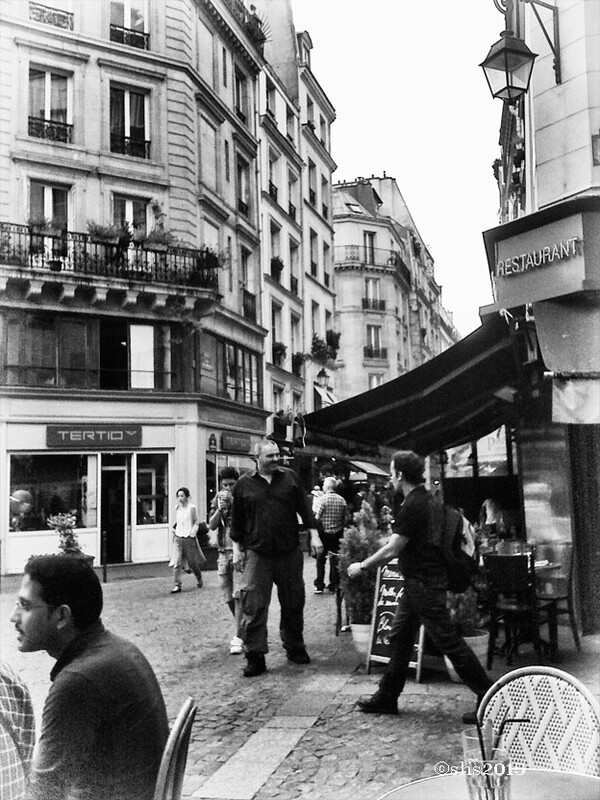 I love street photography…and Paris..and eavesdropping…so this post totally spoke to me! Thanks! I am just falling in love with Street Photography! I should put the photos on their own page! Just what does it take to get organised! Do you do any street Photog? I ll go take a look! I love new discoveries!! That’s the fun of people watching, Susan. You don’t need to know what they’re saying when you can go right ahead and make it up there and then! Great photo. Thanks for stopping by and sorry for the long delay! I’ve been in the middle of a major project. I just love Paris.